I’ve had (self diagnosed) tendinitis on my right ankle since the beginning of July. I stopped running a couple of weeks after the ache started, perhaps I should have stopped sooner. Anyway, I started doing these eccentric heel drops on August 11, with leg straight, then with legs bent up and down on both legs – and will do for 12 weeks. The most painful movement is pointing of toes (balletic style), and going up/down stairs. Walking is fine. Squats/bending down on tip toes hurt sometimes, and these are used a lot in capoeira, but, although I have stopped running, it doesn’t feel like I need to change my capoeira training too much, apart from jumping a little less, keeping things lower impact. The tenderness and weakness comes and goes and on one occasion when the pain was almost gone I went for a 4.8km slow run on 08/08. The pain came back with a vengeance, so that’s when I started the eccentric heel drops exercises and accepted this injury might be here for a while. I have been doing the eccentric exercises for 2 weeks and everything feels less painful, but by no means back to normal. Anyway, I have another 10 weeks to go… Will report back then. Towards the end of July I had also seen an advert for PiYo and ordered them for cheap on eBay (£31 for the Deluxe full set of DVDs + bonus). Because I have been doing a weekly session of Ashtanga Yoga since May my body has been reminded how beneficial low impact, strength & flexibility workouts can be. So I have tried most of the DVDs in the PiYo now. I read this Fitnessista review before buying/trying the workout to give me an idea of what to expect. I’m not actually doing the full PiYo calendar programme, just the longest workouts (Sweat & Drench) and I do find them challenging enough to go back for more. I really don’t like the music though, but that can be turned off. This was my first Chalene Johnson workout. She’s a legend and a very successful fitness entrepreneur! I thought it would feel a little like exercise for absolute beginners but if definitely isn’t. There are enough push ups and sweats in there to make it a challenge. Upper: (20 minutes) This workout emphasizes upper body and core strength. This workout involves a combination of pushups, roll-ups, planks (with side planks), and beasts. I liked this workout, but didn’t find it super challenging. Lower: (20 minutes) This workout includes more of a traditional-ish vinyasa flow, with triceps pushups, low lunges, high lunges, Warrior series, and balance series. I particularly liked the 3-point and crouching crow exercises. Like I mentioned before, I wanted more when this one was over. It felt very short to me! Sweat: (35 minutes) This was one of my favorite workouts. The first portion of the workout is Heat, which increases the heat rate through sun salutations and other exercises mixed in. You start sweating pretty quickly! The next part, Lower Body, emphasizes lunges with balance exercises and skaters. Next is Plank and Core work, with lots of planks and PiYo pushups. The last part of the workout (my fave) was power, which included burpees (yessssss) and squat variations. I felt like this was a perfectly balanced workout, especially with adding in 10-15 minutes of cardio afterwards. 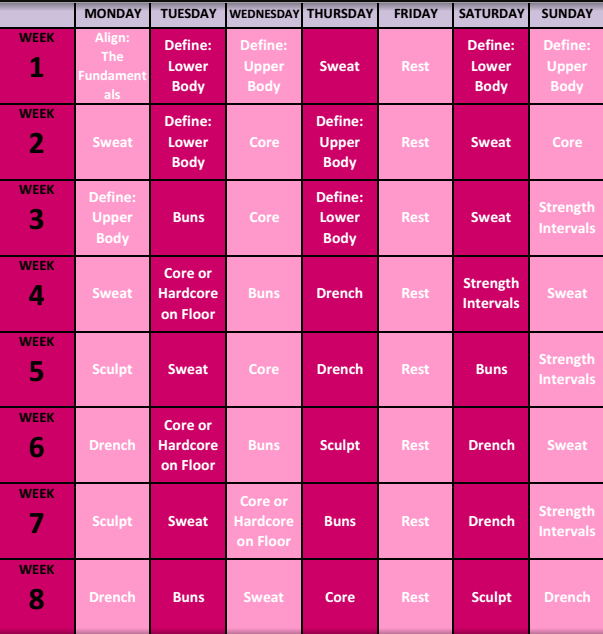 Drench: (48 minutes) This workout most closely replicates a full class. You start off with Heat (sun salutations, push-ups, planks), then move into Legs (low lunge, Warrior 3, knee lifts and speed skaters), Plank and Core, Power (lunges, squats and more burpees!) and Stretch (alternating between strength and flexibility exercises). I was drenched in sweat the first time I completed this workout, and my legs were on fiiiiire. Haven’t done this one much as I think Capoeira has this covered! Buns: (28 minutes) This was KILLER, and probably my favorite workout of the set. Similar to the other workouts, Chalene led through a progression starting with Heat and then starts to light up your lower body. There are a lot of squats and sumo burpees in this one, which cranked up my heart rate and also gave me an awesome burn. This is a great “legs day” workout and one that I’ll definitely be coming back to. Strength Intervals: (22 minutes) My workout cup of tea. This one starts off in the same manner (Heat, into Legs, Plank + Core, etc.) but also includes some cardio blasts to increase your heart rate. I really liked this one, and got a good sweat, but wished the duration was a bit longer. The beast combo was a beast! There are also two bonus DVDs (PiYo Full Body Blast with slider & PiYo Strong Legs with slider), which involve using something I can only describe as sliding plates on your feet (sliders). I have watched them, they look hard! but haven’t fully done them yet. On the Bonus side are also PiYo TurboFire (19 mins) and PiYo Sculpt (27 mins). For someone who hasn’t exercised in a while/ever it’s also a low impact, good intro into fitness. Also worth watching the PiYo Align DVD once before starting the programme, if you’re not familiar with Pilates zipping, for example.